Las Vegas - Local kid Jessie Vargas (24-0, 9 KOs) defeated fellow unbeaten Khabib Allakhverdiev (19-1, 9 KOs) of Derbent, Russia via Unanimous Decision to capture the Russian's WBA Super Lightweight title. Vargas, 24, was the more accurate puncher of the two, hitting Allakhverdiev, 31 with his jabs and straights, producing bruising in the former champion's face in the process. 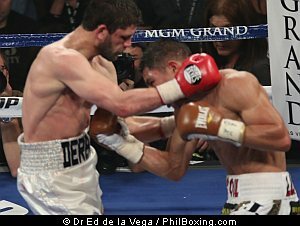 Allekhverdiev fought bravely, stalking the young fighter throughout the fight, but he was being countered by the young Vargas. His face was obviously swollen and red by the 7th round and Vargas targeted it with his jabs and then he dug to the Russian's body to lower his defenses further exposing his face. Vargas was also mobile, eluding his opponents's punches while throwing shots before that. A couple of vicious uppercuts wowed the crowd at The MGM Grand but Allakhverdiev took it well. Scores at ringside are 115-113 twice and 117-111 for the new world champion.